Diane Larivee is a Associate Director, Data Center Services at ESPN. Diane Larivee is a U.S. Navy Veteran who served as an Electronics Technician specializing in satellite communications. She is currently the Associate Director of Data Center Services in the Technology Division at ESPN. She is a certified Network Forensics Professional and proficient in Network Protocol Analysis and holds a number of industry related certifications. Ms. Larivee has held a variety of positions within the computer networking field and is knowledgeable in multi-vendor network design, installation and management. She has worked in the Health Care, Insurance and Financial industries as well as with Government agencies. She is a member of the New England chapter of Women in Cable Telecommunications (WICT) and the Society of Broadcast Engineers (SBE). She has been with ESPN since 2003. 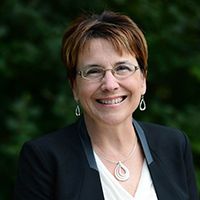 Ms. Larivee holds Bachelor’s degree in Psychology from Central Connecticut State University, with a Minor in Communication. Her area of focus is in Industrial and Organizational Psychology and she is a student member of the Society of Industrial and Organizational Psychology. In May of 2015 she was inducted into Psi Chi, the International Honor Society of Psychology. She is currently pursuing a Master’s of Science in Communication at Purdue University through the Brian Lamb School of Communication. At ESPN, Inc. Diane serves as the co-chair of the ESPN Veterans ERG providing support to employee Veterans and Veteran outreach initiatives via specialty events. In 2013 she received service recognition awards from Senators Richard Blumenthal and Chris Murphy and an official citation from the State of Connecticut General Assembly for her work in the Veterans community. In addition, Diane is co-founder and advisor to the ESPN Women in Technology Group, whose mission is to provide networking and support opportunities for Technology women. The program’s goal is to create a comprehensive strategy for recruitment and retainment and establish a well-rounded development program for women within the Technology Division. In 2014 she received the Touchstone Award from the New England chapter of WICT recognizing her work in support of Women in Technology. Diane lives in Bristol, CT and is the proud parent of four children. She has performed as a cellist with the Cheshire Symphony Orchestra and has volunteered as an animal care specialist with the Connecticut Humane Society.